As you drive the single track road along the Trotternish peninsula’s east coast, you’re probably intermittently snatching glances out to sea or up at the hills. And who could blame you? It’s beautiful! 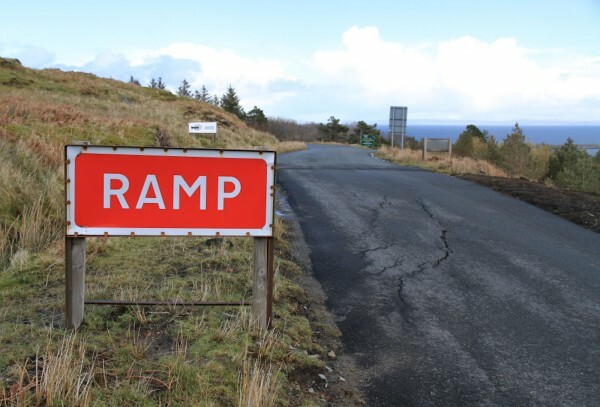 You could therefore be forgiven for not noticing the signs indicating roadside maintenance as you drive through Flodigarry, but there’s no missing the sharp bump and sudden lurch downwards on one side of your car as you pass a certain spot on the road. This short stretch of road is riddled with bumps and cracks because it’s been hit by a landslide. Nothing unusual in that, you might think. After all, in recent years we’ve become accustomed to hearing how the Rest and be Thankful pass on the A83 between Lochs Long and Fyne has been closed by landslides of mud. But unlike the torrential rain-induced landslides that inconvenience Scottish motorists and hauliers from time to time, the one at Flodigarry isn’t a single short-lived event. It’s ongoing and the road therefore requires regular maintenance. It’s also part of something much larger, immense in size, though from the coastal road the true scale of the place is hidden by your close proximity to it. It’s only when you view it from afar, from across the bay in Staffin, that you see the bigger picture. From that vantage point you can see the whaleback hill of Meall na Suiramach, presenting its cliffs to the sea. This is the northern end of the Trotternish ridge, an escarpment that stretches 30km from just north of Portree, all the way up the peninsula towards Rubha Hunish. A little below Meall na Suiramach’s cliffs is an improbable jumble of grass-topped rock towers and crags, which appear to be have been frozen mid tumble in a variety of strange angles. Below this and to the right is a maze of grassy hummocks and domes. 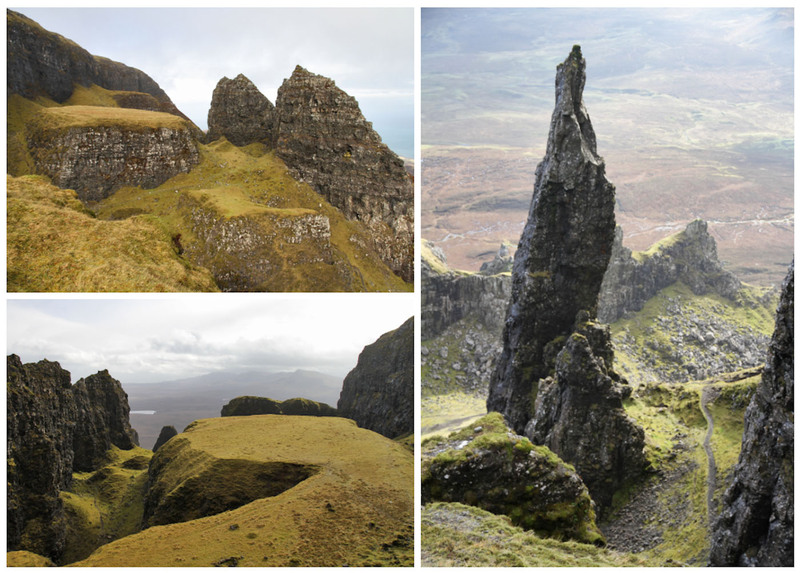 Collectively these features are known as the Quiraing, the largest landslide in Britain. 2km wide, the Quiraing stretches all the way from the escarpment down to the sea and covers a total area of 8.5 sq km, but it’s actually part of a much bigger series of ancient landslides all along the Trotternish ridge. The Storr is the most famous of these slides, justly so because of its shapely rock needle known as the ‘Old Man’, but the Quiraing is arguably the more impressive. Describing it as a landslide gets us part of the way towards understanding why the Quiraing looks the way it does, but it doesn’t tell us why the ground has shifted like it has on such an immense scale. Its story starts in the Jurassic period, around 175 million years ago. At this time, what is now Skye was mostly submerged in shallow seas or estuaries, in which sand, sediment and the remains of sea creatures were laid down and accumulated to considerable depths. Under their own enormous collective weight the sediment particles were compacted, water was squeezed out, and crystals formed that cemented the particles together. After millions of years under these conditions you’re left with a hard ‘sedimentary’ rock. 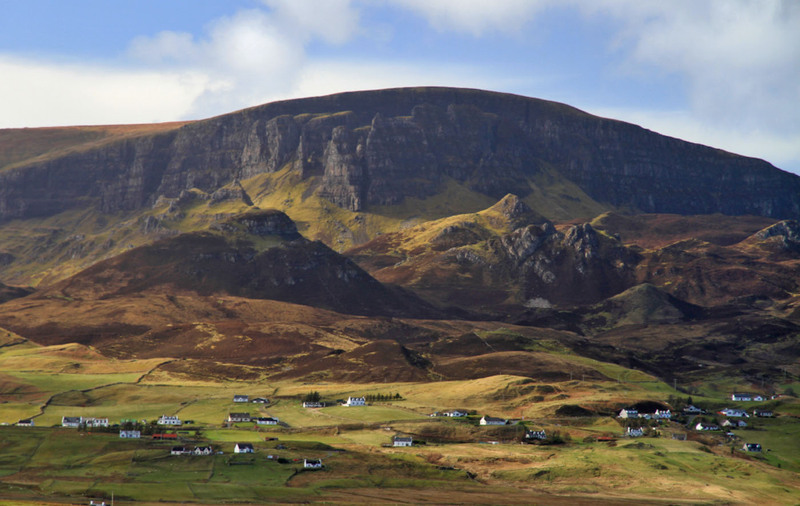 In the case of Skye the sedimentary Jurassic rocks were a mix of sandstones, shales and limestones. These layers of rock, forming for the most part a level surface, are believed to have remained submerged underwater for millions of years. But by around 60 million years ago the sea had retreated and the land was exposed. This coincided with the start of a monumental process, one that continues to this day. The ancient land mass started to tear apart to form the beginnings of the Atlantic Ocean, as what are now North America and Greenland began to separate from Europe. It wasn’t a happy divorce. Just as with any other object or material that you try to pull apart, enormous stresses were put on the Earth’s surface. It tore open in enormous fissures, allowing molten rock to push out and cover the already ancient Jurassic rocks with a vast lava field. A total of 24 different lava flows have been recorded at Trotternish, some only a couple of metres in thickness and some up to 30m thick, but in total the flows eventually produced a combined layer of volcanic rock some 300m thick. That’s the height of the Eiffel Tower! 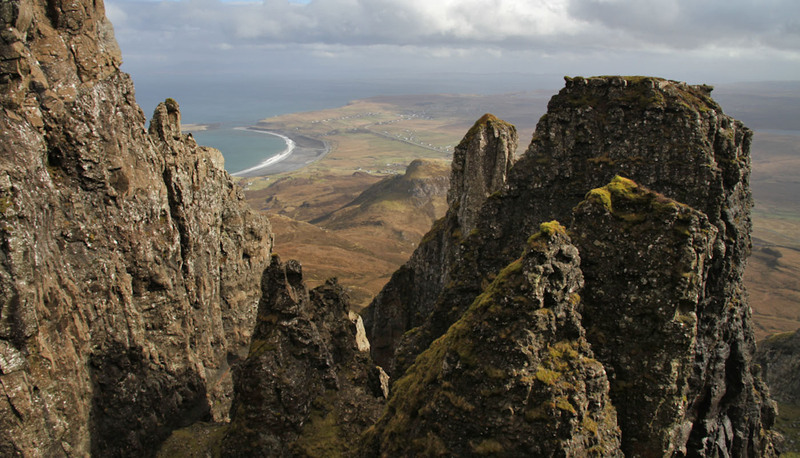 10 million years later, after the volcanic activity had ceased, continued movements in the earth made the land in this part of Skye tilt upwards towards the east, which in turn created weaknesses, or ‘faults’ in the rock, running north to south. All the pieces were now in place for landslides to begin. The enormous weight of all that volcanic rock slowly took its toll on the weaker sedimentary rock below, which fractured and broke under the strain. It’s a bit like trying to stack stone building bricks on top of a freshly made sand-castle. Gravity has since pulled the whole thing downwards towards the sea, and the enormous blocks of volcanic rock have been rotated slightly as they broke away and slipped down the hillside. Although some of the lower reaches of the Quiraing landslide date back to or beyond the most recent ice age, the enormous upper portions appear to have come free extremely recently in geological terms. Some time in the last 15,000 years in fact, long after the ice on Skye melted. And of course, the state of the road at Flodigarry shows how the Quiraing still has a fair bit of shifting to do before it settles comfortably into its new position. While the Quiraing is undoubtedly spectacular and intriguing when viewed from Staffin, nothing really compares with getting up close and strolling about the place. Several access points let you do this, most notably from Flodigarry in the north and from the Uig hill road to the west. These are lofty paths that skirt around the escarpment cliffs and offer fine views of the weird features above you, but to really appreciate the Quiraing you have to ascend still further, up the steep grassy slopes into the heart of the rocky labyrinth. As you ascend you encounter those parts of the hill that have slid downwards and now stand isolated as features in their own right. Innumerable towering pinnacles and yawning chasms greet you at every rise and turn, but the most famous are the Prison, a triple-summited crag that guards entry from the west, the 120ft spire-like Needle, and the outrageously improbable Table. The Table is the most revealing feature of the whole complex but, ironically, it is the hardest to locate if you’re ascending from below. Situated just below the top of the escarpment it’s a flat, almost perfectly rectangular area of grass raised aloft and hidden from its immediate surroundings atop a huge rocky plinth. It’s so level and so well proportioned that it looks very much like a football pitch that’s been plonked there by human hand. Top left: the Table seen from below. Bottom left: the Table seen from above. Right: The Needle, with the Prison behind it and lower down. The playing field analogy is fitting, since many guidebooks you encounter will tell you the Table was used for shinty matches. It’s definitely flat enough, although I’d be weary of chasing the ball towards the edge! It’s also widely claimed that folk hid cattle up there from Viking raiders. It’s certainly a perfect hiding place, as you would never expect there to be a flat grassy area up there amongst such a jumble of fractured, rocky towers. But when you realise that the Table was once part of the summit plateau of Meall na Suiramach it all makes sense. This small segment of the mountain has broken off and sunk downwards, and now stands isolated. This is perhaps most clearly illustrated when you stand on the hill above and look down into the Quiraing. Equally as interesting, however, is the ground at your feet. When you explore the higher reaches you’ll encounter all manner of disconcerting holes and gashes in the ground. Some are barely a foot across and you can easily step over them, but others are much wider. Once you know what they are, that they’re evidence of a landscape tearing itself apart, the whole place feels a little unnerving and you suddenly feel very small indeed. Don’t worry though! 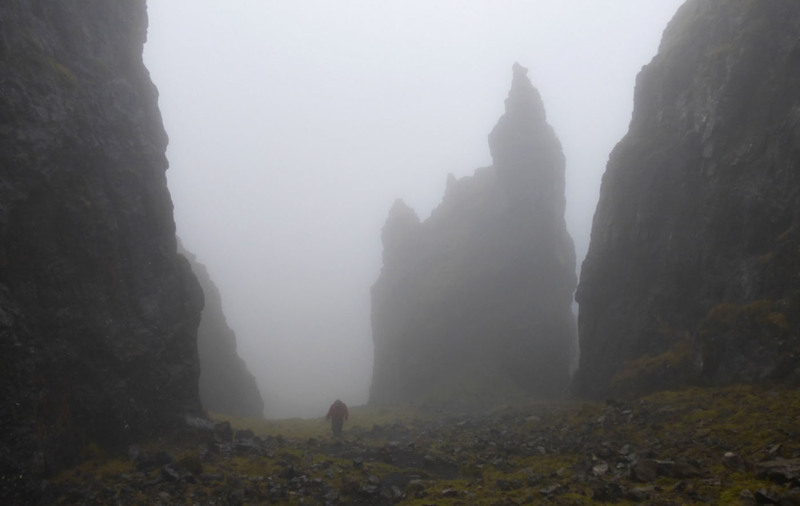 Most sources I encountered in the course of writing this piece seemed confident that the bulk of the Trotternish ridge, including the Storr, is now stable. The Quiraing, though considered active, also appears to be mostly stable with movement concentrated further down towards the coast. You can therefore reasonably expect that nothing is going to change dramatically while you’re there. Speaking personally though, having knowledge of that fact doesn’t make the Quiraing any less unnerving. It’s such a bizarre place that it’s easy to let your imagination run away with itself, and when mist hangs low on the hills a visit to the Quiraing can be an astonishingly atmospheric experience. I’d even go so far as to say it’s one of the few places I know that is perhaps at its best in the fog, (although that of course denies you the stunning views across Trotternish). Under conditions like that, the pinnacles and crags loom out of the murk in menacing fashion and the whole place gives Mordor a run for its money! The Quiraing is situated on the Trotternish peninsula of the Isle of Skye. It can be visited as part of our classic Quiraing circuit route, or the first part of that walk can be used to simply get close. Our Fingal’s pinnacles route explores a further part of the landslip. The Quiraing is also visited as part of the Skye Trail long distance route.